Kyle Busch has been a critic of the 2019 Monster Energy NASCAR Cup Series aerodynamic rules package since NASCAR announced it late last year. After participating in a two-day test at Las Vegas Motor Speedway on Jan. 31 and Feb. 1, he still isn’t a fan. The new aero package includes air ducts and a tapered spacer that will reduce horsepower to 550 and variations of it will be used in races on mile-and-a-half tracks. NASCAR’s aim is to improve the racing product by bunching cars up, resulting in drafting. 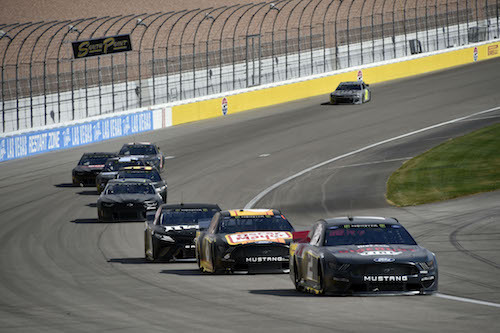 NASCAR officials including Executive Vice President and Chief Racing Development Officer Steve O’Donnell and Vice President of Innovation and Racing Development John Probst attended the test, and according to Probst, were happy with what they saw. Fourteen Cup Series teams, each with one driver and car, participated in the test that included multiple drafting sessions. With three manufacturer representatives, or “wheel force” cars on hand, up to 17 cars were on-track at a time. According to Darrell Wallace Jr., handling was sketchy in the pack. “When we got in the pack, it was a little bit of a handful, and we’ve still got to work on passing a little bit,” Wallace said. Busch, though, predicted little passing, especially up front. The new package will make its debut at Atlanta Motor Speedway on Feb. 24, the second race of the season. The Cup Series will run its first of two races at LVMS on March 3.